Hosseini Nasab, F., Hossein Nedjad, S., Movaghar Garabagh, M. (2010). X-ray diffraction peak profile analysis of maraged Fe-Ni-Mn steels. International Journal of Iron & Steel Society of Iran, 7(2), 18-20. F. Hosseini Nasab; S. Hossein Nedjad; M. R. Movaghar Garabagh. "X-ray diffraction peak profile analysis of maraged Fe-Ni-Mn steels". 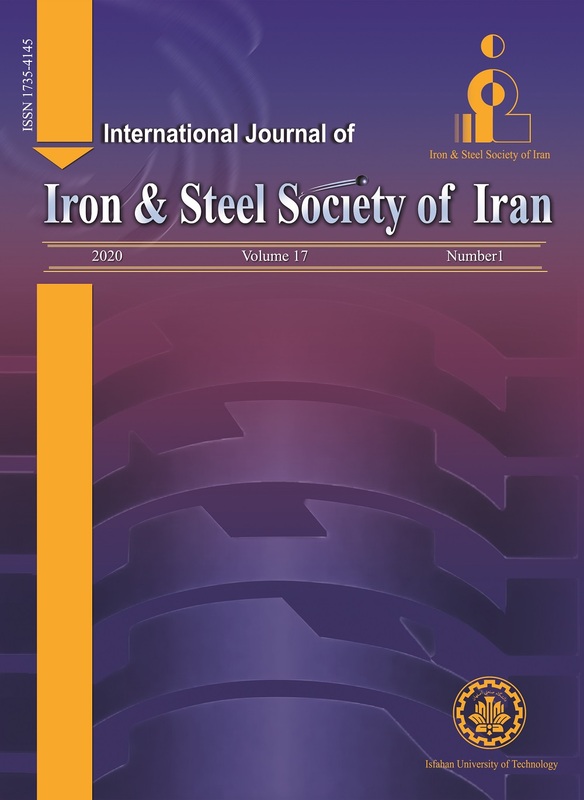 International Journal of Iron & Steel Society of Iran, 7, 2, 2010, 18-20. Hosseini Nasab, F., Hossein Nedjad, S., Movaghar Garabagh, M. (2010). 'X-ray diffraction peak profile analysis of maraged Fe-Ni-Mn steels', International Journal of Iron & Steel Society of Iran, 7(2), pp. 18-20. Hosseini Nasab, F., Hossein Nedjad, S., Movaghar Garabagh, M. X-ray diffraction peak profile analysis of maraged Fe-Ni-Mn steels. International Journal of Iron & Steel Society of Iran, 2010; 7(2): 18-20. X-ray diffraction peak profile analysis was used to identify changes in the lattice distortions during isothermal aging of Fe-10Ni-7Mn (wt. %) maraging steel. Integral peak breadths were analyzed using classical Williamson-Hall equation taking the elastic anisotropy into account. It was found that substantial lattice distortions rise during precipitation hardening which depend strongly on the specific Young’s modulus of a given crystallographic direction. After normalizing by elastic stiffness, the magnitude of average lattice distortions increased reasonably in accordance with age hardening. G.P. Miller and W.I. Mitchell: J. Iron Steel Inst., 203(1965), 899. W. Sha: Scripta Mater., 42(2000), 2653. S. Mahadevan and T. Jayakumar: Metall. And Mater. Trans. A, 39(2008), 1978. J.D. Kamminga and L.J. Seijble: J. Res. Natl. Inst. Stand. Technol., 109(2004), 65. B.E. Warren: X-ray diffraction, Addison-Wesley publishing company, (1969), 125. G.K. Williamson and R.E. Smallman: Acta-Cryst.,7(1954), 574. Y. Zhong, F. Yin, T. Sakaguchi, K. Nagai and K. Yang: Acta. Mater., 55(2007), 2747. G.K. Williamson and W.H. Hall: Acta Metall., 22 (1953), 22. S. Hossein Nedjad and M.R. Movaghar Gharabagh: Int. J. Mater. Res. (formerly Z. Metallk. ), 99(2008), 1248. R.I. Garrod and J.H. Auld: Acta Metall., 3(1955), 190. T. Suzuki: Trans. JIM, 11(1970), 257. M. Yodogawa: Trans. JIM, 17(1976), 799. V.M. Kardonskii and M.D. Perkas: Metals Sci.Heat Treat., 4(1966), 254. J. Singh and C.M. Wayman: Mater. Sci. Eng., 94(1987), 233.